Owner surrender as their child was allergic. They are both very sweet and loving dogs, seemed to be potty trained and are getting along fine with fosters dogs. 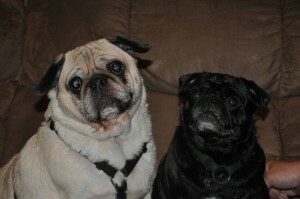 Darla and Spanky are Adopted! Hello, I just wanted to tell you that I know the family who had to give up Spanky and Darla and we visited them often with our baby. Both dogs were gentile and very tolerant, even as our son became a rather wild toddler and “hugged” them with much enthusiasm. It was heartbreaking to watch the family have to part with these wonderful dogs. We would have taken them ourselves if we didn’t already have 2 dogs of our own. I hope you are able to find a home as loving as the one they came from. Thank you so much for your efforts.